How to choose variable to display in tooltip when using ggplotly? which get me a tooltip, but with only seq and value. I tried the option tooltip= but it's specified you can use the only variable describe in the aesthetic, and I don't use the name in my aes. Any solution? I saw I am not the first with this problem, but I haven't found answer working with ggplotly. and the tooltip will display name in addition to seq and value. The default, "all", means show all the aesthetic mappings (including the unofficial "text" aesthetic). So you can use the label aesthetic as long as you don't want to use it for geom_text. geom_path: Each group consists of only one observation. Do you need to adjust the group aesthetic? However, I find the unofficial text aesthetic can become useful alongside label if you want to have different strings plotted by geom_text and shown in the tooltip. Edit to answer a question in comments: The tooltip parameter to ggplotly() can be used to control the appearance. ggplotly(tooltip = NULL) will suppress tooltips at all. ggplotly(tooltip = c("label")) selects the aesthetics to include in the tooltip. I have to add a dummy group aesthetic for the geom_line to work properly as @UweBlock suggested. At last I choose what I want to show in the tooltip (here I excluded group). EDIT: With the release of plotly 4.0 the syntax will change a little bit. Not the answer you're looking for? 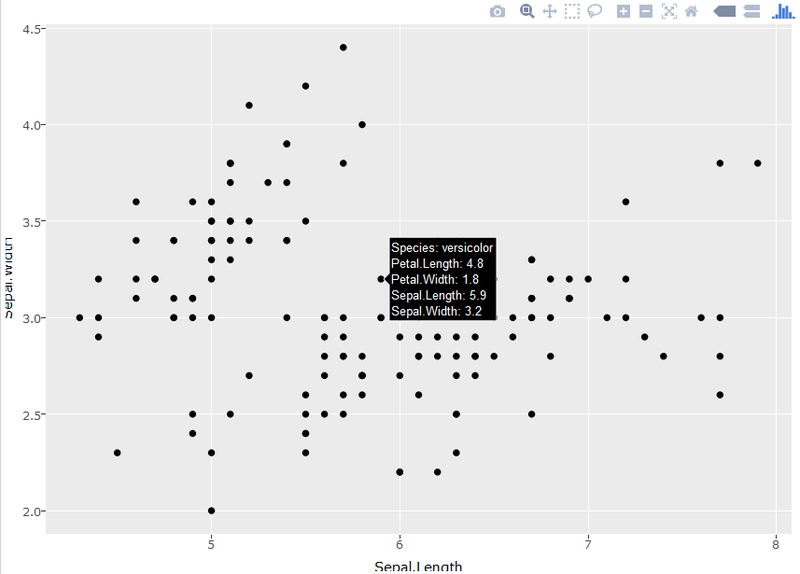 Browse other questions tagged r ggplot2 plotly r-plotly ggplotly or ask your own question. How to customize the tooltip of ggplotly?